Nothing says style more than a bespoke suit. A custom made suit is made specifically for your body. Every cut and stitched is based on a specific measurement. Unlike made to measure, where an already made suit is tailored to your body, a bespoke is specifically designed with you in mind. Working alongside Mark, together, you select the style, the number of pockets, the buttons, the lining, and most importantly, the wool that will become your one-of-a kind suit that will be the envy of your friends and coworkers. Many men immediately dismiss the affordability of a bespoke suit. Bespoke suits at Maestro are more affordable than you may realize. Once you purchase a well-made suit with quality fabric, then have the necessary tailoring performed, you have essentially purchased your bespoke suit. Mark uses a specific measuring system, so that your exact measurements are translated into the best fitting suit you will ever own. 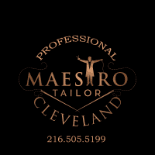 If you are looking for bespoke suits, shirts, or overcoats, Maestro will be the only tailor you will ever need.